This cartoon, published in 2003, refers to an unusual situation where the Crown Law Office sued the office of the ombudsmen for deciding that the Ministry of Social Development should release addresses of state tenants to the Department of Courts so that tenancy judgement orders could be enforced. 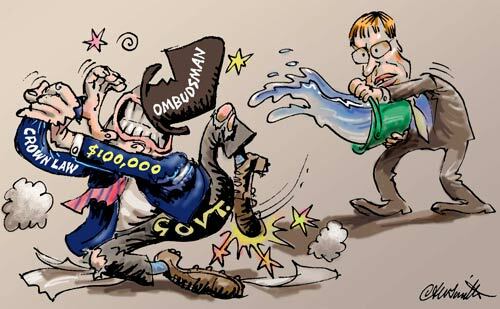 Parliament granted the ombudsmen's office $100,000 to defend itself. ACT MP Stephen Franks (right) supported the ombudsman's decision and was outraged at the waste of public funds. He believed that the bodies concerned should be cooperating, not fighting each other. In the end, the legal proceedings were aborted by the Crown Law Office, days before the hearing.